This entry was posted in Safety at home on 2013/08/01 by Susan. A carbon monoxide (CO) leak had tragic consequences for two people in Burnaby, BC recently. A man and woman in their 50s died while sleeping in their trailer after being exposed to a CO leak from a propane-powered generator. RCMP Cpl. David Reid told the CBC that neighbours said the man had been replacing part of the generator the day before. “It would appear that it was not reopened, so that would mean that when the generator was running, the propane leakage was basically funneling carbon monoxide inside the trailer,” Reid told CBC, quoted in this story. This tragedy didn’t happen in a workplace, but many others do. WorkSafeBC reports nearly 50 claims in the past five years related to CO exposure – in carpet cleaning, plumbing, and on fishing boats. 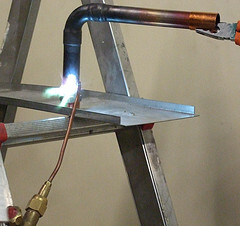 Furnaces, boilers, kilns, natural gas space heaters, fires, welding activity can create CO. So can pressure washers and other tools. The Canada Safety Council reports that CO exposure is the country’s leading cause of fatal poisonings. “Any indoor workplace where engines are running presents a potential hazard. Workers must realize that fuel-powered machines can expose them to this deadly gas,” says the CSC on their website. This includes workers in confined spaces, large buildings, outdoor areas, and places that may seem to be well-ventilated but are not. “Emergency workers can be at risk; without a CO detector they may not realize the danger until too late. Farmers have succumbed to CO poisoning while using a gasoline pressure washer inside the barn,” says the CSC. Proper carbon monoxide detectors are crucial for alerting people to the presence of this odourless, colourless, tasteless gas. “Carbon monoxide can cause health problems before people even notice it is present,” reads Carbon Monoxide – on the Health Canada website. So please review your own risks – at work, at home, and on the road – and make sure your carbon monoxide detector is working.